Wonderful things can happen when we make art together. 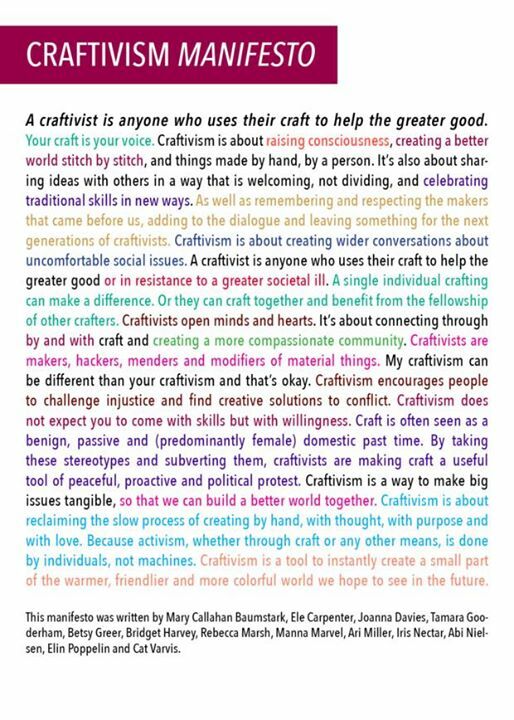 “Craftivism” is the idea of combining craft-making with activism to promote positive change within our communities and beyond. On Thursday March 29 at Red Brick Café, I invite you to explore what Craftivism means to you. Whether that’s using art as a tool to stand up for something you believe in, making a colourful craft to brighten up someone’s day, or simply just slowing down from the busyness of everyday life to finish that art piece you’ve been putting off for too long. There will be intentional crafts you are welcome to take a part of: Larissa will give demos on various printmaking techniques, Fossil Free Guelph will be making t-shirts, and other community members will speak about ways that art has helped advocate for something they believe in. Some examples include: sketching, bracelet-making, oragami, poetry, model-making, cross-stitching, watercolours, patch-making, knitting, colouring, woodburning, DIY stuff, what have you. Bring your latest project or start a new one. All humans and all creative mediums are welcome! The cover is $5 or PWYC at the door. Let’s share an evening of positive space and creative ideas together.